Carl Trueman delivers a powerhouse of a message on the place the preacher has as a prophet who confronts people with God. An important message for the contemporary church, which has reduced the function of preaching to that of a coach or an advisor rather than one who communicates the voice of God. 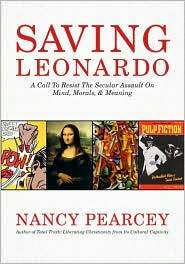 Greg Koukl interviews Nancy Pearcey about how secularization has claimed the arts, and discusses her book Saving Leonardo. If you’re like me, you will want to order her book. 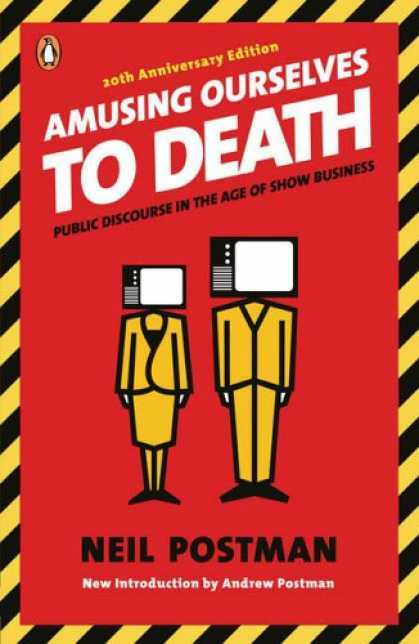 Al Mohler invited a number of guests to Southern Seminary to participate in a panel discussion about Neil Postman’s classic book Amusing Ourselves to Death 25 years after it’s publication. Was Neil right? Okay, the Think! Conference was in October. It’s almost January and I haven’t posted anything about it. To be honest, I struggled with what I should and should not say about it. Was it good? It was fabulous. Almost all of the messages were phenomenal: Piper, Sproul, DeYoung, Mohler, Anyabwile and Alcorn were very stong. This was also my first taste of Francis Chan and Tillian Tchividjian and I was very impressed and humbled by their messages. A load of great material from this conference. The conference opened with Rick Warren, and this is where I struggled. Ricks message was great, in fact excellent, until he got to the end. He discussed the reality that spiritual warfare presents against thinking and the truth of God. But at the end it all seemed to implode. Rick Warren’s view of application is horrific, because it drives him to believe that churches are preaching and teaching believers too much. In his reasoning, the more we preach and teach the more “applications” people have to apply to their lives, and we can only really apply so much in a given week. A pseudo-therapeutic gospel? I also disagree with Warren’s view of “vision”, though that’s an unfair assessment since he didn’t have the platform to engage with Piper’s differing view of vision. Piper does engage these two things in the follow up discussion, which unfortunately Warren was not able to participate in, but I wish he had been much stronger on the application issue. I’ll leave it at that. My recommendation: get these messages, including Rick Warren’s. The first part was a message I would have been proud to have preached. If you haven’t purchased a good audio Bible for your iPod or iPhone, the time has never been better for prices. If you want to try it out before forking over the few dollars, you can download the entire Gospel of John for free over at the Listener’s Bible. Prices have also dropped on the download of the New Testment at $19.95, and the entire Bible for a measly $29.95. If you prefer a physical MP3 CD, you can purchase it through Amazon for $32.97. Okay, not literally a sermon preached by Luther, but a construction of a sermon by Dr. Roland Bainton and delivered by Dr. Rod Rosenblat. Though Luther never wrote nor preached this sermon, it is assembled from his writings as a series of parts, as Dr. Bainton envisioned Luther could have written a Christmas sermon. The free Christian Audio book for the month of December is Handel’s Messiah: Comfort for God’s People. It’s written by “music expert” Calvin Stapert. As more and more people are buying iPods, iPhones, and iPads, audio gifts will be more and more welcome. So here are a number of gift ideas in the audio category. This series has been a big hit with my kids, and we have ordered the new addition to this series for this year. Jonathan Park and his family investigate the wonders of the world from a creationist perspective and battle the forces of evolutionary theory. These series are chocked full of scientific information that will equip you and your children to handle those who oppose creationism and promote evolution. View Jonathan Park Titles at Amazon. Purchase the new Jonathan Park installment ‘The Voyage Beyond’ at Amazon. I’ve just started listening to this audio Bible and am really enjoying it. 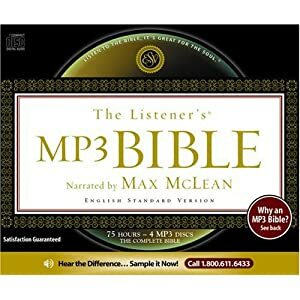 Max McLean’s audio Bible has been my favorite for years. 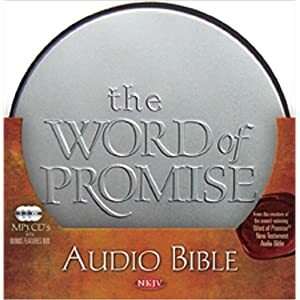 The Word of Promise Bible brings audio dramatics with music, sound effects and voice actors to play the roles. This is read from the NKJV. If you decide to get this Bible, one word of warning — do not purchase it from iTunes. The iTunes version is broken down into a handful of files, making it impossible to select books and chapters. Make sure you purchase the MP3 CD. Purchase Word of Promise MP3 CD at Amazon. My all-time favorite audio Bible is Max McLean’s recording of the ESV translation. I’ve been through this one many times and still love it. I’m not sure the iTunes version has all the broken down files as is wanting in the Word of Promise version. If you opt for iTunes, check the comments to see if there are any angry purchasers who encountered the same problem. Purchase The Listener’s Bible MP3 CD at Amazon. 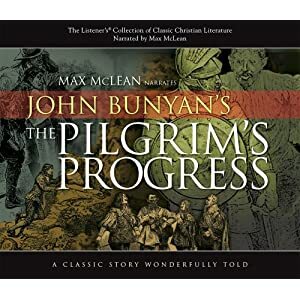 Another winner by McLean is his narration of the classic Pilgrim’s Progress. Pilgrims Progress can be a challenging read, but Max makes it very entertaining and lively. Highly recommended. T his list wouldn’t be complete without this Australian’s fun work. Colin is a Christian musician who creates music for kids and adults. He’s a big hit in our home and he could be in yours as well. Hop over to Colin’s web store. I want to direct your attention to the SLJ Institute which holds over 1400 sermons in mp3 of Sinclair Lewis Johnson. Sinclair was a masterful preacher and this resource is a tremendous treasure of expository preaching. Through the years I have listened to the preaching of S. Lewis Johnson far more than any other preacher.